At one time or another, all science enthusiasts have heard the late Carl Sagan’s infamous words: “We are made of star stuff.” But what does that mean exactly? How could colossal balls of plasma, greedily burning away their nuclear fuel in faraway time and space, play any part in spawning the vast complexity of our Earthly world? How is it that “the nitrogen in our DNA, the calcium in our teeth, the iron in our blood, the carbon in our apple pies” could have been forged so offhandedly deep in the hearts of these massive stellar giants? Unsurprisingly, the story is both elegant and profoundly awe-inspiring. All stars come from humble beginnings: namely, a gigantic, rotating clump of gas and dust. Gravity drives the cloud to condense as it spins, swirling into an ever more tightly packed sphere of material. Eventually, the star-to-be becomes so dense and hot that molecules of hydrogen in its core collide and fuse into new molecules of helium. These nuclear reactions release powerful bursts of energy in the form of light. The gas shines brightly; a star is born. The ultimate fate of our fledgling star depends on its mass. Smaller, lightweight stars burn though the hydrogen in their core more slowly than heavier stars, shining somewhat more dimly but living far longer lives. Over time, however, falling hydrogen levels at the center of the star cause fewer hydrogen fusion reactions; fewer hydrogen fusion reactions mean less energy, and therefore less outward pressure. At a certain point, the star can no longer maintain the tension its core had been sustaining against the mass of its outer layers. Gravity tips the scale, and the outer layers begin to tumble inward on the core. But their collapse heats things up, increasing the core pressure and reversing the process once again. A new hydrogen burning shell is created just outside the core, reestablishing a buffer against the gravity of the star’s surface layers. While the core continues conducting lower-energy helium fusion reactions, the force of the new hydrogen burning shell pushes on the star’s exterior, causing the outer layers to swell more and more. The star expands and cools into a red giant. Its outer layers will ultimately escape the pull of gravity altogether, floating off into space and leaving behind a small, dead core – a white dwarf. Heavier stars also occasionally falter in the fight between pressure and gravity, creating new shells of atoms to fuse in the process; however, unlike smaller stars, their excess mass allows them to keep forming these layers. The result is a series of concentric spheres, each shell containing heavier elements than the one surrounding it. Hydrogen in the core gives rise to helium. Helium atoms fuse together to form carbon. Carbon combines with helium to create oxygen, which fuses into neon, then magnesium, then silicon… all the way across the periodic table to iron, where the chain ends. 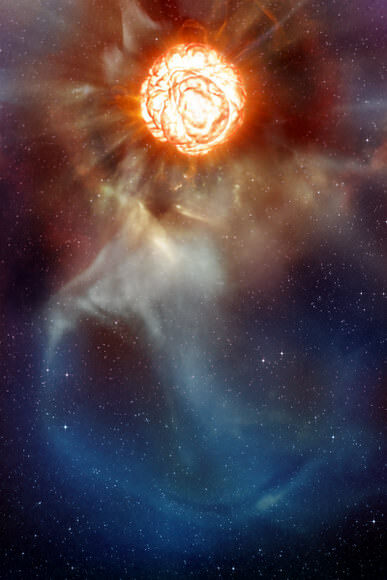 Such massive stars act like a furnace, driving these reactions by way of sheer available energy. But this energy is a finite resource. Once the star’s core becomes a solid ball of iron, it can no longer fuse elements to create energy. As was the case for smaller stars, fewer energetic reactions in the core of heavyweight stars mean less outward pressure against the force of gravity. The outer layers of the star will then begin to collapse, hastening the pace of heavy element fusion and further reducing the amount of energy available to hold up those outer layers. Density increases exponentially in the shrinking core, jamming together protons and electrons so tightly that it becomes an entirely new entity: a neutron star. At this point, the core cannot get any denser. The star’s massive outer shells – still tumbling inward and still chock-full of volatile elements – no longer have anywhere to go. They slam into the core like a speeding oil rig crashing into a brick wall, and erupt into a monstrous explosion: a supernova. The extraordinary energies generated during this blast finally allow the fusion of elements even heavier than iron, from cobalt all the way to uranium. Periodic Table of Elements. Massive stars can fuse elements up to Iron (Fe), atomic number 26. Elements with atomic numbers 27 through 92 are produced in the aftermath of a massive star’s core collapse. Since there are stars and galaxies in all directions, why is space black? Shouldn’t there be a star in every direction we look? Imagine you’re in space. Just the floating part, not the peeing into a vacuum hose or eating that funky “ice cream” from foil bags part. If you looked at the Sun, it would be bright and your retinas would crisp up. The rest of the sky would be a soothing black, decorated with tiny little less burny points of light. If you’ve done your homework, you know that space is huge. It even be infinite, which is much bigger than huge. If it is infinite you can imagine looking out into space in any direction and there being a star. Stars would litter everything. Dumb stars everywhere wrecking the view. It’s stars all the way down, people. So, shouldn’t the entire sky be as bright as a star, since there’s a star in every possible minute direction you could ever look in? If you’ve ever asked yourself this question, you probably won’t be surprised to know you’re not the first. Also, at this point you can tell people you were wondering about it and they’ll never know you just watched it here and then you can sound wicked smart and impress all those dudes. This question was famously asked by the German astronomer Heinrich Wilhelm Olbers who described it in 1823. We now call this Olbers’ Paradox after him. Here let me give you a little coaching, you’ll start your conversation at the party with “So, the other day, I was contemplating Olbers’ Paradox… Oh what’s that? You don’t know what it is… oh that’s so sweet!”. The paradox goes like this: if the Universe is infinite, static and has existed forever, then everywhere you look should eventually hit a star. Our experiences tell us this isn’t the case. So by proposing this paradox, Olbers knew the Universe couldn’t be infinite, static and timeless. It could be a couple of these, but not all three. In the 1920s, debonair man about town, Edwin Hubble discovered that the Universe isn’t static. In fact, galaxies are speeding away from us in all directions like we have the cooties. This led to the theory of the Big Bang, that the Universe was once gathered into a single point in time and space, and then, expanded rapidly. Our Universe has proven to not be static or timeless. And so, PARADOX SOLVED! Here’s the short version. We don’t see stars in every direction because many of the stars haven’t been around long enough for their light to get to us. Which I hope tickles your brain in the way it does mine. Not only do we have this incomprehensibly massive size of our Universe, but the scale of time we’re talking about when we do these thought experiments is absolutely boggling. So, PARADOX SOLVED! Well, not exactly. Shortly after the Big Bang, the entire Universe was hot and dense, like the core of a star. A few hundred thousand years after the Big Bang, when the first light was able to leap out into space, everything, in every direction was as bright as the surface of a star. So, in all directions, we should still be seeing the brightness of a star.. and yet we don’t. As the Universe expanded, the wavelengths of that initial visible light were stretched out and out and dragged to the wide end of the electromagnetic spectrum until they became microwaves. This is Cosmic Microwave Background Radiation, and you guessed it, we can detect it in every direction we can look in. So Olbers’ instinct was right. If you look in every direction, you’re seeing a spot as bright as a star, it’s just that the expansion of the Universe stretched out the wavelengths so that the light is invisible to our eyes. But if you could see the Universe with microwave detecting eyes, you’d see this: brightness in every direction. Did you come up with Olbers’ Paradox too? What other paradoxes have puzzled you? What is the Smallest Star? We’ve talked about the biggest stars, but what about the smallest stars? What’s the smallest star you can see with your own eyes, and how small can they get? Space and astronomy is always flaunting its size issues. Biggest star, hugest nebula, prettiest most talented massive galaxy, most infinite universe, and which comet came out on top in the bikini category. Blah blah blah. In an effort to balance the scales a little we’re going look at the other end of the spectrum. Today we’re talking small stars. First, I’m going to get the Gary Coleman and Emmanuel Lewis joke out of the way, so we can start talking about adorable little teeny tiny fusion factories. We get big stars when we’ve got many times the mass of the Sun’s worth of hydrogen in one spot. Unsurprisingly, to get smaller stars we’ll need less hydrogen, but there’s a line we can’t cross where there’s so little, that it won’t generate the temperature and pressure at its core to ignite solar fusion. Then it’s a blob, it’s a mess. It’s clean-up in aisle Andromeda. It’s who didn’t put the lid back on the jar marked H.
So how small can stars get? And what’s the smallest star we know about? In the traditional sense, a star is an object that has enough mass and pressure in its core that it can ignite fusion, crushing atoms of hydrogen into helium. Fusion is exothermic, releasing energy. It’s this energy that counteracts the force of gravity pulling everything inward. That gives you the size of the star and keeps it from collapsing in on itself. By some random coincidence and fluke of nature our Sun is exactly 1 solar mass. Actually, that’s not true at all, our shame is that we use our Sun as the measuring stick for other stars. This might be the root of this size business. We’re in an endless star measuring contest, with whose is the most massive and whose has the largest circumference? So, as it turns out, you can still have fusion reactions within a star if you get all the way down to 7.5% of a solar mass. This is the version you know as a red dwarf. We haven’t had a chance to measure many red dwarf stars, but the nearest star, Proxima Centauri, has about 12.3% the mass of the Sun and measures only 200,000 kilometers across. In other words, the smallest possible red dwarf would only be about 50% larger than Jupiter. There is an important distinction, this red dwarf star would have about EIGHTY times the mass of Jupiter. I know that sounds crazy, but when you pile on more hydrogen, it doesn’t make the star that much bigger. It only makes it denser as the gravity pulls the star together more and more. At the time I’m recording this video, this is smallest known star at 9% the mass of the Sun, just a smidge over the smallest theoretical size. Proxima Centauri is about 12% of a solar mass, and the closest star to Earth, after the Sun. But it’s much too dim to be seen without a telescope. In fact, no red dwarfs are visible with the unaided eye. 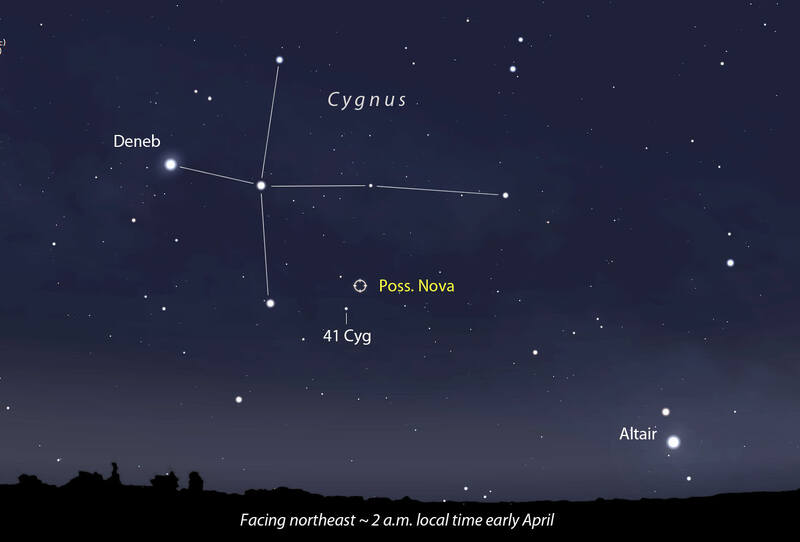 The smallest star you can see is 61 Cygni, a binary pair with one star getting only 66% the size of the Sun. It’s only 11.4 light years away, and you can just barely see it in dark skies. After that it’s Spock’s home, Epsilon Eridani, with 74% the size of the Sun, then Alpha Centauri B with 87%, and then the Sun. So, here’s your new nerd party fact. The Sun is the 4th smallest star you can see with your own eyes. All the other stars you can see are much bigger than the Sun. They’re all gigantic terrifying monsters. And in the end, our Sun is absolutely huge compared to the smallest stars out there. We here like to think of our Sun as perfectly adequate for our needs, it’s ours and all life on Earth is there because of it. It’s exactly the right size for us. So don’t you worry for one second about all those other big stars out there. How Quickly Do Black Holes Form? A star can burn its hydrogen for millions or even billions of years. But when the party’s over, black holes form in an instant. How long does it all take to happen. Uh-oh! You’re right next to a black hole that’s starting to form. In the J.J. Abrams Star Trek Universe, this ended up being a huge inconvenience for Spock as he tried to evade a ticked off lumpy forehead Romulan who’d made plenty of questionable life choices, drunk on Romulan ale and living above a tattoo parlor. So, if you were piloting Spock’s ship towards the singularity, do you have any hope of escaping before it gets to full power? Think quickly now. This not only has implications for science, but most importantly, for the entire Star Trek reboot! Or you know, we can just create a brand new timeline. Everybody’s doing it. Retcon, ftw. Most black holes come to be after a huge star explodes into a supernova. Usually, the force of gravity in a huge star is balanced by its radiation – the engine inside that sends out energy into space. But when the star runs out of fuel to burn, gravity quickly takes over and the star collapses. But how quickly? Ready your warp engines and hope for the best. Here’s the bad news – there’s not much hope for Spock or his ship. A star’s collapse happens in an instant, and the star’s volume gets smaller and smaller. Your escape velocity – the energy you need to escape the star – will quickly exceed the speed of light. You could argue there’s a moment in time where you could escape. This isn’t quite the spot to argue about Vulcan physiology, but I assume their reaction time is close to humans. It would happen faster than you could react, and you’d be boned. But look at the bright side – maybe you’d get to discover a whole new universe. Unless of course Black holes just kill you, and aren’t sweet magical portals for you and your space dragon which you can name Spock, in honor of your Vulcan friend who couldn’t outrun a black hole. Here we’ve been talking about what happens if a black hole suddenly appears beside you. The good news is, supernovae can be predicted. Not very precisely, but astronomers can say which stars are nearing the end of their lives. Here’s an example. In the constellation Orion, Betelgeuse the bright star on the right shoulder, is expected to go supernova sometime in the next few hundred thousand years. That’s plenty of time to get out of the way. So: black holes are dangerous for your health, but at least there’s lots of time to move out of the way if one looks threatening. Just don’t go exploring too close! If you were to fall through a black hole, what do you think would happen? Naw, just kidding, we all know you’d die. Why don’t you tell us what your favorite black hole sci fi story is in the comments below! When Did the First Stars Form? Shortly after the Big Bang, the Universe had cooled to the point that the first stars could form out of the primordial hydrogen. How long did it take, and what did these first stars like? Hydrogen soup. Doesn’t that sound delicious? Perhaps not for humans, but certainly for the first stars! Early in the Universe, in a spectacular show of stellar soupification, clouds of hydrogen atoms gathered together. They combined with one another. The collected mass got bigger and bigger, and after a time, ignition. The first stars were alive! Well, alive in the sense that they were burning – not that they had feelings or knew what was going on, or had opinions, or were beginning to write would what would eventually become the first Onion article or anything. But where did all that gas come from, and can we spot the evidence of those long-ago stars today? As you know, the Big Bang got our Universe off to a speedy start of expansion. It then took 400,000 years for us to see any light at all. Protons and electrons and other small particles were floating around, but it was far too hot for them to interact. Once the power of the Big Bang finally faded, those protons and electrons paired up and created hydrogen. This is called, rather uninventively, “recombination”. I’d rather just call it hydrogen soup. We’ve got energy. But what is the secret ingredient that sparked these stars? It was just that soup clumping together over time. We can’t say to the minute when the first stars formed, but we have a pretty good idea. The Wilkinson Microwave Anisotropy Probe, aka WMAP examined what happened when these clouds of hydrogen molecules got together, creating tiny temperature differences of only a millionth of a degree. Over time, gravity began to yank matter from spots of lower density into the higher-density regions, making the clumps even bigger. Fantastically bigger. So big that about 200 million years after the clumps were formed, it was possible for these hydrogen molecules to ram into each other at very high speeds. This process is called nuclear fusion. On Earth, it’s a way to produce energy. Same goes for a star. 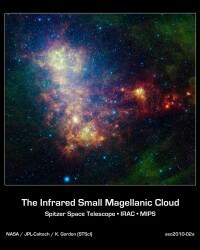 With enough nuclear reactions happening, the cloud of gas compresses and creates a glow. And these stars weren’t tiny – they were monsters! NASA says the first stars were 30 to 300 times as massive as the sun, shining millions of times brighter. The supernova that produced the Crab Nebula was detected by naked-eye observers around the world in 1054 A.D. This composite image uses data from NASA’s Great Observatories, Chandra, Hubble, and Spitzer. But this flashy behavior came at a price, because in only a few million years, the stars grew unstable and exploded into supernovae. These stars weren’t only exploding. They were also altering the soup around them. They were big emitters of ultraviolet light. It’s a very energetic wavelength, best known for causing skin cancer. So, this UV light struck the hydrogen surrounding the stars. This split the atoms apart into electrons and protons again, leaving quite the mess in space. But it’s through this process that we can learn more about these earliest stars.The stars are long gone, but like a criminal fleeing the scene, they left a pile of evidence behind for their existence. Splitting these atoms was their evidence. This re-ionization is one key piece of understanding how these stars came to be. So it was an action-packed time for the universe, with the Big Bang, then the emergence of soup and then the first stars. It’s quite an exciting start for our galactic history. What do you think the first stars looked like? I sat straight up in my seat when I learned of the discovery of a possible new supernova in the bright Virgo galaxy M61. Since bright usually means close, this newly exploding star may soon become visible in smaller telescopes. It was discovered at magnitude +13.6 on October 29th by Koichi Itagaki of Japan, a prolific hunter of supernovae with 94 discoveries or co-discoveries to his credit. Itagaki used a CCD camera and 19.6-inch (0.50-m) reflector to spy the new star within one of the galaxy’s prominent spiral arms. Comparison with earlier photos showed no star at the position. 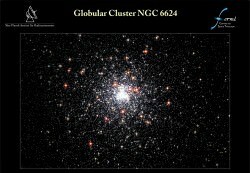 Itagaki also nabbed not one but two earlier supernovae in M61 in December 2008 and November 2006. Overnight, Ernesto Guido and crew used a remote telescope in New Mexico to confirm the new object. We’re still waiting for a spectrum to be absolutely sure this is the real deal and also to determine what type of explosion occurred. In the meantime, it may well brighten in the coming mornings. Supernovae are divided into two broad categories – Type Ia and Type II. In a Type Ia event, a planet-sized white dwarf star in close orbit around a normal star siphons off matter from its companion which builds up on the surface of the dwarf until it reaches critical mass at which point the core ignites and consumes itself and the star in one titanic nuclear fusion reaction. A cataclysmic explosion ensues as the star self-destructs in blaze of glory. Type Ia explosions can become 5 billion times brighter than the Sun – the reason we can see them across so many light years – and eject matter into space at 5,000 – 20,000 km/second. Type II events mark the end of the life of a massive supergiant star. As these behemoths age, they burn by fusing heavier and heavier elements in their cores from hydrogen to carbon to silicon and finally, iron-nickel. Iron is inert and can’t be cooked or fused to create more energy. The star’s internal heat source, which has been staving back the force of gravity all these millions of years, shuts down. Gravity takes hold with a vengeance, the star quickly collapses then rebounds in a titanic explosion. Ka-boom! Like the Type Ia event, a Type II supernova grows to fantastic brilliance. Besides a legacy of radiant light, star debris, the creation of heavy elements like gold and lead, a Type II event will sometimes leave behind a tiny, city-sized, rapidly-spinning neutron star – the much compressed core of the original star – or even a black hole. So yes, life can continue for a giant star after a supernova event. But like seeing a former classmate at your 40th high school reunion, you’d hardly recognize it. Are you itching to see this new supernova for yourself? Here are a couple maps to help you find it. 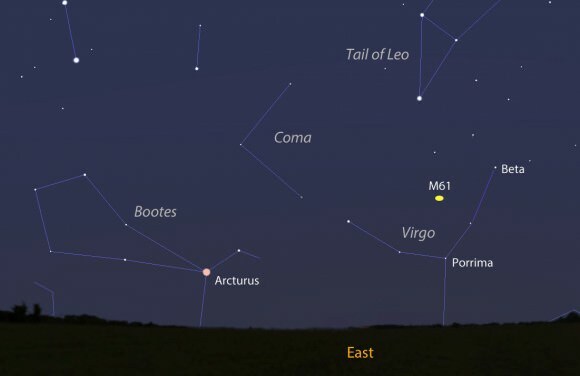 M61 is located in the middle of the “Y” of Virgo not far from the familiar bright double star Gamma Virginis. From many locations, the galaxy climbs to 15-20° altitude in the east-southeast sky just before the start of dawn, just high enough for a good view. Once you find the galaxy, look for a small “star” superimposed on its eastern spiral arm as shown in the photo at the top of this article. I’ll be out there with my scope watching and will report back once it’s established what type of supernova happens to be blowing up in our eyepieces. More information about the new object can be found anytime at David Bishop’s Latest Supernovae site. Good luck, clear skies! ** Update Nov. 1 : M61’s supernova now has a name and type! SN 2014dt is a Type Ia (exploding white dwarf) with some peculiarities in its spectrum. It’s also little brighter at magnitude +13.2. Are All the Stars Really Dead? Have you ever heard that meme, “When looking at stars, you’re actually looking into the past. Many of the stars we see at night have already died.” Is this true? Aww, that’s mean and sad. But is it true, Squidward? Are all these beautiful stars in our night sky long gone? Like our dreams? Light travels at about 300,000 km/s, which is incredibly fast. Stars are so far away, even light from the closest stars will take years to get to us travelling at that speed. Most of the stars we see with the naked eye are actually pretty close. The brightest in the night sky is Sirius in the constellation Canis Major. It’s only about 8.6 light years away. Which means if you crashed a whole bunch of spaceships into it tomorrow, we here on Earth wouldn’t see it happen for almost a decade. Long after people had stopped wondering where you’d picked up all those spaceships, and why had you decided to crash them into a star instead of trading for gold pressed latinum, the spice Melange, or magical space cheese. 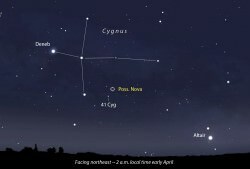 One of the most distant naked eye stars is Deneb in the constellation Cygnus, which is almost 3,000 light years away. The light we’re seeing from Deneb started its journey towards us when ancient Rome was just a few hamlets and not even on the map for real estate speculators. This might seem like a really long time for those of us without immortal robot bodies, but a few thousand years is negligible to the age of a typical star, which is on the order of billions of years. So, Deneb, barring removal for an interstellar bypass, is probably still there. There are a few stars that could possibly explode in the near future, such as the red giant star Betelgeuse in the constellation of Orion. It’s about 650 light years away, if it had exploded a couple centuries ago, we still wouldn’t know. There are a few galaxies that can be seen with the naked eye, such as Andromeda, which is about 2.5 million light years away. Given that Andromeda has somewhere between 200 and 400 billion stars, it is almost certain that some of them have exploded in the last 2 and a half million years. But the vast majority of them have are still there, twinkling away. So it is possible that you could look up in the night sky and see a “dead” star, but almost all of the stars you see are perfectly active main-sequence stars, and will be for quite some time. Telescopes allow us to see much further out into space, billions of light years away. Given that a star like our Sun has a lifetime of about 10 billion years, many stars in most of the distant galaxies we observe died long ago. But don’t be sad, we’re not running out of stars. Because of this huge passage of time, it means many new stars have been born, and we just aren’t able to see them yet. There are some stars even in the most distant galaxies that are still around. Smaller stars live longer than larger stars, and red dwarf stars can live for trillions of years. So when you look at the Hubble Ultra Deep Field, the most distant galaxies are around 13 billion years old, and the smaller stars in those galaxies are still shining. So don’t worry. Those stars are still there, and so are your dreams. What do you think? If you go get a closeup look and see which stars were still around, where would you go look first? Tell us in the comments below. Active regions 2108 and 2109 are now passing around the limb of the Sun, but not before solar photography specialist Alan Friedman grabbed a few pictures of them on Friday! The image above, captured by Alan from his location in Buffalo, NY, shows the two large sunspots nestled in a forest of solar spicules while a large detached prominence hovers several Earth-diameters inside the corona. A beautiful snapshot of our home star! Captured in hydrogen-alpha wavelengths, the image above has been colored by Alan, rotated 90 degrees counterclockwise, and inverted from the original. The sunspots and standing prominence are cooler in Ha than the surrounding chromosphere and corona, and so actually photograph darker. 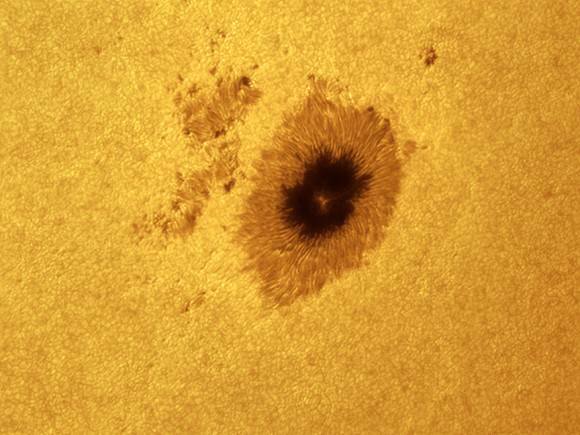 AR2109 photographed by Alan Friedman on July 11, 2014. Sunspots are the result of magnetic fields rising up from deep within the Sun, preventing convection from occurring in large areas on the Sun’s surface and thereby creating relatively cooler regions we see as dark spots. They can often be many times the size of Earth and can be sources of powerful solar flares. See these and more images by Alan on his blog here. Images © Alan Friedman. All rights reserved. One has never been spotted for sure in the wild jungle of strange stellar objects out there, but astronomers now think they have finally found a theoretical cosmic curiosity: a Thorne-Zytkow Object, or TZO, hiding in the neighboring Small Magellanic Cloud. With the outward appearance of garden-variety red supergiants, TZOs are actually two stars in one: a binary pair where a super-dense neutron star has been absorbed into its less dense supergiant parter, and from within it operates its exotic elemental forge. First theorized in 1975 by physicist Kip Thorne and astronomer Anna Zytkow, TZOs have proven notoriously difficult to find in real life because of their similarity to red supergiants, like the well-known Betelgeuse at the shoulder of Orion. It’s only through detailed spectroscopy that the particular chemical signatures of a TZO can be identified. Observations of the red supergiant HV 2112 in the Small Magellanic Cloud*, a dwarf galaxy located a mere 200,000 light-years away, have revealed these signatures — unusually high concentrations of heavy elements like molybdenum, rubidium, and lithium. While it’s true that these elements are created inside stars — we are all star-stuff, like Carl Sagan said — they aren’t found in quantity within the atmospheres of lone supergiants. Only by absorbing a much hotter star — such as a neutron star left over from the explosive death of a more massive partner — is the production of such elements presumed to be possible. Definitive detection of a TZO would provide direct evidence for a completely new model of stellar interiors, as well as confirm a theoretically predicted fate for massive star binary systems and the existence of nucleosynthesis environments that offer a new channel for heavy-element and lithium production in our universe. One of the original proposers of TZOs, Dr. Anna Zytkow, is glad to see her work resulting in new discoveries. The findings were first announced in January at the 223rd meeting of the American Astronomical Society. The paper has now been accepted for publication in the Monthly Notices of the Royal Astronomical Society Letters, and is co-authored by Philip Massey, of Lowell Observatory in Flagstaff, Arizona; Anna Zytkow of the University of Cambridge in the U.K.; and Nidia Morrell of the Carnegie Observatories in La Serena, Chile. Read the team’s paper here. *In the paper the team notes that it’s not yet confirmed that HV 2112 is part of the SMC and could be associated with our own galaxy. If so it would rule out it being a TZO, but would still require an explanation of its observed spectra.